Example 1. School administrators study the attendance behavior of high school juniors over one semester at two schools. Attendance is measured by number of days of absent and is predicted by gender of the student and standardized test scores in math and language arts. Many students have no absences during the semester. Example 2. The state wildlife biologists want to model how many fish are being caught by fishermen at a state park. Visitors are asked whether or not they have a camper, how many people were in the group, were there children in the group and how many fish were caught. Some visitors do not fish, but there is no data on whether a person fished or not. Some visitors who did fish did not catch any fish so there are excess zeros in the data because of the people that did not fish. Let’s pursue Example 2 from above using the dataset fish. 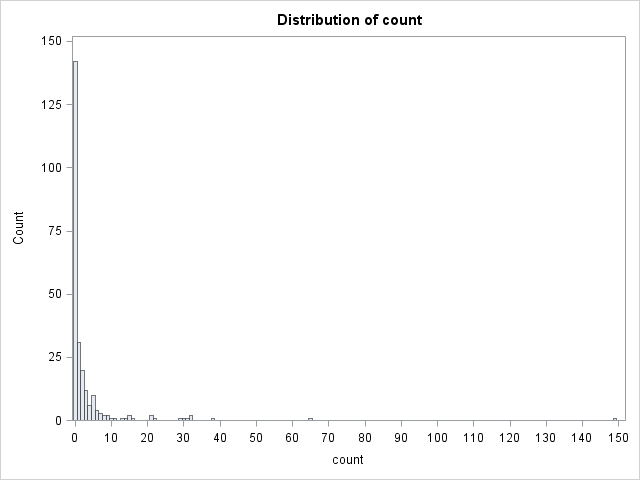 In addition to predicting the number of fish caught, there is interest in predicting the existence of excess zeros, i.e., the zeroes that were not simply a result of bad luck fishing. We will use the variables child, persons, and camper in our model. Let’s look at the data. Zero-inflated Negative Binomial Regression – Negative binomial regression does better with over dispersed data, i.e., variance much larger than the mean. If you are using SAS version 9.2 or higher, you can run a zero-inflated Poisson model using proc genmod. The output begins with a summary of the model and the data. This is followed by a list of goodness of fit statistics. The next block of output includes parameter estimates from the count portion of the model. It also includes the standard errors, Wald 95% confidence intervals, Wald Chi-square statistics, and p-values for the parameter estimates. The last block of output corresponds to the zero-inflation portion of the model. This is a logistic model predicting the zeroes. The output includes parameter estimates for the inflation model predictors and their standard errors, Wald 95% confidence intervals, Wald Chi-square statistics, and p-values. All of the predictors in both the count and inflation portions of the model are statistically significant. This model fits the data significantly better than the null model, i.e., the intercept-only model. To show that this is the case, we can run the null model (a model without any predictors) and compare the null model with the current model using chi-squared test on the difference of log likelihoods. The log likelihoods for the full model and null mode are -1031.6084 and -1127.0229, respectively. The chi-squared value is 2*( -1031.6084 – -1127.0229) = 190.829. Since we have three predictor variables in the full model, the degrees of freedom for the chi-squared test is 3. This yields a p-value <.0001. Thus, our overall model is statistically significant. We may want to compare the current zero-inflated Poisson model with the plain poisson model, which can be done with the Vuong test. Currently, the Vuong test is not a standard part of proc genmod, but a macro program that performs the Vuong test is available from SAS here. Usage of the macro program requires the %include statement, in which we list the location of the macro. This macro program takes quite a few arguments, as shown below. We rerun the models to get produce these required input arguments. With the zero-inflated Poisson model, there are total of five regression parameters which includes the intercept, the regression coefficients for child and camper for the Poisson portion of the model as well as the intercept and regression coefficient for persons. The plain Poisson regression model has a total of three regression parameters. The scale parameter is the dispersion parameter from each corresponding model, and for our poisson model is fixed at 1. For the Vuong test, a significant z indicates that the zero-inflated model is better. Here we see that the preferred model is a zero-inflated Poisson model over a regular Poisson model. The positive values of the z statistics for Vuong test indicate that it is the first model, the zero-inflated poisson model, which is closer to the true model. We can use the estimate statement to help understand our model. We will compute the expected counts for the categorical variable camper while holding the continuous variable child at its mean value using the atmeans option, as well as calculate the predicted probability that an observation came from the zero-generating process. In the estimate statement, we provide values at which to evaluate each coefficient for both the Poisson model and the zero-inflation model. The sets of coefficients of the two models are separated by the @ZERO keyword. In the Mean Estimate column, we find predicted counts of fish from the Poisson model, ignoring the zero-inflation model, for both camper = 0 and camper = 1, as well as the predicted probability of belonging to the zero-generating process from the zero-inflation model. The zero-inflation model does not include camper as a predictor, so the probability of zero for both zero-inflation models is the same. To get the expected counts of fish from the mixture of the two models, simply multiply the expected counts from the Poisson model by the probability of getting a non-zero from the zero-inflation model (1 – p(zero)). Thus, the expected counts of fish for camper = 0 and camper = 1 including zero-inflation are 2.422*(1-0.4677) = 1.289 and 5.5768*(1-0.4677) = 2.968, respectively. Proc countreg is another option for running a zero-inflated Poisson regression in SAS (again, version 9.2 or higher). This procedure allows for a few more options specific to count outcomes than proc genmod. The proc countreg code for the original model run on this page appears below. We indicate method = qn to specify the quasi-Newton optimization process that matches the proc genmod results. camper 1          0               0               .        .         .
For those using a version of SAS prior to 9.2, a zero-inflated negative binomial model is doable, though significantly more difficult. Please see this code fragment: Zero-inflated Poisson and Negative Binomial Using Proc Nlmixed.